Shadowrun Seattle is located on Puget Sound and Washington Lake, in what used to be Washington State, just below what also used to be the Canadian border. The area is hilly and mountainous, with a variety of lakes and streams. There is at least one major faultline nearby (related to the Cascadia Subduction Zone) and – of course – Mount Rainier, a currently-active volcano. 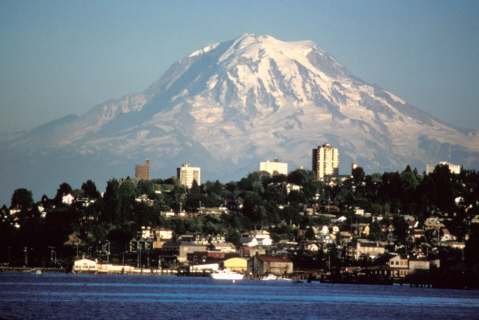 Mount Rainier is located to the south, nearly on the borders of the outlying districts, and is close enough to the city center to dominate the southern skyline to the point where locals simply refer to it as “the mountain”. Since the Great Ghost Dance, occasional ashfalls add to the misery of the people in the ruinous Puyallup district, which is closest to the active vents. The climate is cool and wet, averaging more than 200 rainy days per year. In 2054 it has an (official) population of some 3,000,000 and an area of slightly over 1600 square miles. The population is approximately 66% human, 16% Ork, 10% Dwarf, 5% Elf, 2% Troll, and 1% Exotic. While there’s plenty of pollution remaining to clean up, fusion-based recycling is cheap enough that toxic dumping – like the smog resulting from the burning of now incredibly-expensive fossil fuels – is almost a thing of the past. For comparison, New York City as of 2008 had an area or slightly more than 300 square miles and a population of nearly nine million. The city is large and bustling, but there’s still a good deal of space in the area around it. Transportation systems within the city include several air taxi services, cars and buses (with computerized traffic control), boats and ferrys, the downtown monorail systems, and a limited (and never completed) subway system left over from the 2020’s. Routes in and out include a sealed-tube Maglev train connecting the city to San Francisco, several ground routes into the bordering Indian Nations, and several air-transport options, including suborbital and orbital jumps. Rumors of magical routes and passages leading into mystical tunnel systems are likely to remain just that – rumors. For entertainment, there’s the Matrix, Simsense, Simsense Gaming, Trid broadcasts (including plenty of pirate channels), Music, Sports (Football, Basketball, Baseball, Combat Bikers, and Urban Brawl), Clubs, and Fighting Leagues – ranging from classical boxing on through the Unlimited-Class Wrestling Foundation and on to backroom gladiatorial events – and, of course, a wide selection of drugs, sexual amusements, and eccentric services. In every category, there are plenty of amateurs to compete with the professional groups. For more conventional services – stores, restaurants, hotels, shops, hospitals and clinics, mechanics, and everything else – you can count on finding everything from expensive upper-end services on through no-frills hole-in-the-wall outfits, all varying in dependability, discretion, and price. Expect to pay for quality and privacy if you want it, but don’t count on actually getting what you pay for unless you keep a careful eye out. Simply being expensive doesn’t make something good. Leaving the secure zones? What with the ghouls, gangs, and monsters, you’ll want at least an armored vest and a pistol. Even the corpcops expect that. You can’t do without your credstick either; it’s your ID, keys, passport, and credit card. If it’s a bad day and you can afford it, you may want to wear a filter mask – but bad days are rare now: fusion plants provide almost all the power, and the cars run on synthetic alcohol and fuel cells. The Metroplex has a governor, a cabinet, a council, and ten districts – each with a mayor and a district council – as well as the UCAS military reservation of Fort Lewis. Downtown: Your basic waterfront city core. Big buildings, big crowds, fairly high security, and decent maintenance. Look here for older airports, hospitals, major corporate facilities (including both the Renraku Arcology and the Aztechnology Pyramid), tourist attractions, giant department stores, hot nightclubs, well-tended parks, high-class neighborhoods, governmental buildings, the Seattle University, and diplomatic facilities, such as Council Island. Bellevue: Downtown lite. Second-tier corps, restaurants, small hotels, and other smaller-scale businesses. The support base for downtown proper, and still pretty secure. Tacoma: A waterfront industrial center and transport hub, as well as housing for the relevant workers. The area includes large parts of the Ork Underground. Tacoma has lots of organized crime and gang activity – but it’s mostly fairly low-key, since the local security forces come down heavily on random violence, but are usually willing to overlook petty scams, small thefts, and dealings in lesser illegal substances and items. Everett: Everett ranges from the shipyards, and the UCAS Naval Base on through the rougher and wilder reaches near the border – suitable for anyone who needs cheap, but tolerably-well supervised space, such as the entertainment industry. Renton: A rural area – or at least as rural as Seattle gets – Renton is even hillier and rougher than most of Seattle, and supports a scattering of farms, various light industries, cheap strip malls, lakes, and patches of woods. The local economy is founded on recreation, minor production facilities, and groups who feel that security starts with physical isolation, such as software designers, research facilities, training bases, and private security firms. Renton is about as backwoods as Seattle gets, and is heavy on small local gangs and anti-metahuman prejudice. Auburn: The older developments in Auburn support most of the old-style pre-fusion manufacturing facilities – dirty, inefficient, polluting, and expensive by current standards, but still too big an investment to write off before they fall entirely to pieces. Of course, as primary manufacturing winds down, the syndicates have been moving in – which hasn’t been mixing smoothly with the environmental activists and the gradual collapse of the economy. Local law enforcement is pretty corrupt, not that they have a lot of choice about it. Snohomish: About the only relatively rural district in Seattle, Snohomish’s land and water is intensively farmed, both by major agribusinesses and by traditional-style small farmers – neither of whom get along very well. Places of any real interest to shadowrunners are pretty thin here. Fort Lewis: The UCAS military zone is a district of forested hills (and a bit of waterfront), run and supervised by the military. Most of what goes on here is oriented towards taking money away from the troops or towards supporting their families. Interestingly, that includes a substantial zoological and botanical garden and research installation. Redmond: A classical urban disaster zone, filled with gangs, slums, crime, waste disposal, and prisons, as well as occasional fortified installations run by those who want to avoid all supervision and/or outside laws and are willing to provide their own services. Outside of installations with such independent systems, services are minimal and erratic. There are lots of illegal jackpoints, power taps, safehouses, illegal operations, fixers, fences, and similar shadow conveniences if you know where to look though. Puyallup: Devastated by the eruption of Mt Rainier, this area remains a mostly-abandoned urban disaster zone today. Compared to Puyallup, in its own illegal way, Redmond is thriving. What do you expect of someplace that regularly gets ash from an active volcano dumped on it? Still, if you want a place to hide out, it’s hard to improve on Puyallup. If you want something illegal, including things most ordinary criminals consider too dangerous or perverse to deal in, you can visit the great flea market of crime for relatively little cash. What it may cost in terms of your self-respect, life, or soul, is quite another matter. The Ork Underground isn’t exactly a “district”, but it approaches one relatively closely. The tunnels extend under Downtown, Tacoma, Everett, and the Puyallup Barrens, although they aren’t all connected. The best sections are under Downtown and Puyallup – areas where quite a lot of buildings and entire streets wound up below ground level at one point or another, and were available for adaption. The Ork Underground offers quite a lot of safehouses, storage locations for smuggled goods, and other clandestine services, but tends to be only readily open to those with the proper connections. is this sentence missing a word? So it is. “rural”. It’s in now.